YOUR LOCAL PHARMACY MAY HAVE MORE FOOD DEALS THAN YOU’RE TAKING ADVANTAGE OF TO LOWER GROCERY COSTS. One of the least read flyers that consumers miss out on chopping their grocery budget hands-down is at the pharmacy. When our weekly flyers would arrive Mrs. CBB handed them to me and the process I followed was to toss out the flyers we had no interest in which used to include pharmacy flyers. It was easier for me to get through the flyers of stores that were familiar to me then those little shops. Boy did I learn a lesson from that mistake. If you haven’t taken the time to look around the pharmacies in your area you might be shocked to find out they offer more than just medicine. The nearest pharmacy to us is a Shoppers Drug Mart (Pharmaprix) and a small family pharmacy located next to a doctor’s office. The main difference between the two is that the small pharmacy doesn’t carry food products like you’d find at almost all the big name pharmacies around Canada. Since being purchased for 12.4 billion by Loblaws in 2014 almost all Shoppers Drug Mart pharmacy stores have ramped up PC products and added even more grocery sales. This is great news for frugal shoppers who make a pit-stop at the pharmacy and want to grab some deals on food. Typically we find in-store specials on the reduced rack as well 50% off any of the refrigerated or frozen foods that are near expiry. Consumers don’t associate a loaf of bread when filling a prescription unless the pharmacy is sharing space with a big box store. This is why we see more and more pharmacies offering rewards programs, flashy savings flyers and lots of marketing. You still don’t think going to the pharmacy to buy groceries is worth it? It sure can be, let me explain more. For even more savings a pharmacy like Shoppers Drug Mart offers a 20% discount on seniors day once a month which makes purchasing flyers specials even more lucrative paired with a rewards program. Toss in a few coupons and you can easily see rewards points add up, discounts grow and coupon savings mount. Let’s look at a frequent offer from Shoppers Drug Mart, Spend $75 get 18,500 bonus points. If you stock up on sale items and use coupons to reach the target $75 you’ll get back $25 in points. That’s pretty amazing if you ask me. Typically we order prescription medication online for our family or we call Shoppers Drug Mart and use their automated refill service. If we can’t make it to Shoppers Drug Mart they will deliver for no charge which is a wonderful service to offer customers. My mother-in-law (MIL) who stays home to take care of her husband typically will have Shoppers Drug Mart deliver their medications to the house. Not all Shoppers or Canadian pharmacies have a delivery service but if there is one then ask if they will deliver more than just medication to you. What my MIL does is takes advantage of the flyer grocery savings and have them delivered as well. There are tonnes of things you can buy at most pharmacies these days besides medications and pharmacy gifts. Most pharmacies that have grocery for sale stock what looks like the mini grocery store version of the bigger supermarkets. No, you won’t see a butcher, fish department, baker etc. at your local pharmacy unless your pharmacy has floor space inside of a grocery store which many do. What you’ll find at a pharmacy are convenient type foods and those loss leaders that likely drive you into the grocery store. That’s marketing at its finest and for most of us who save wherever they can these sales come in handy. That type of convenience is part of the customer service package, keeping it all under one roof. If they can get you to fill your prescriptions and grocery shop at the same time it’s a win for both the store and the pharmacy. Grocery stores such as Metro, Zehrs, Walmart, Sobeys, Costco and Real Canadian Superstore almost all have an in-store pharmacy. Zellers even had a pharmacy even though it wasn’t classified as a grocery store rather a department store. In the final years at Zellers we saw the grocery and frozen food section grow and then dwindle away. Once Walmart saturated the market with their one-stop shopping it was only a matter of time before Zellers became dust under the carpet. Do consumers like to shop under one roof? Many do because of the convenience and time saved without having to drag the family around. I can certainly sympathize now that I’m a father. If stopping at your local pharmacy to purchase flyer savings isn’t in the cards for you then go the price-matching route if possible. You can still get the same savings by letting your cashier know that you are price matching provided it is offered at the store. I asked my Facebook fans last night whether they grocery shop at the pharmacy and what some of the top products are to stock up on when they go on sale. If you look at the list you can see that most of the items are staples and regular price for such products aren’t cheap. On occasion we see tinned soup and beans go on offer as well Kraft Dinner, chips, cookies, frozen or tinned vegetables. If you drink pop the savings are at the pharmacy if you stock up when you see a sale which is quite often. If you want the deals you must do one thing. The key is to read your weekly pharmacy flyer so you know what deals they are offering and apply them to your grocery budget. There are ways to save on groceries and sometimes giving yourself a little extra time to shop might be the difference between stocking up or paying full-price somewhere else. 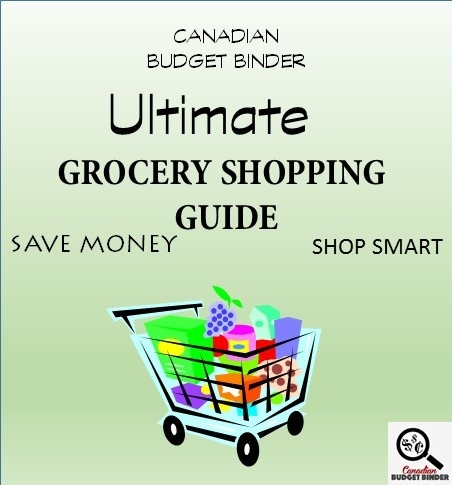 I was intrigued by the responses by many Canadian Budget Binder fans about who shopped for groceries at the pharmacy and who didn’t care too. Some of them have no interest in going into the pharmacy to get deals and others swear by the flyer savings as the best around. I buy some grocery items at Shoppers and London Drugs, London drugs has a surprisingly great selection of ethnic and gluten-free food. And oddly enough they have an amazing sale on a good quality olive oil a couple of times a year, they just started a point system as well but don’t think I will shop there enough to earn much. I’ve never been grocery shopping at a pharmacy!- Melissa D.
Rexall Drugstore is good for bread; milk; sugar. They have soup ; canned tomatoes and peanut butter and jam on sale regularly; and priced better than the grocery stores. – Lisa F.
Never really shop at pharmacies unless they are in a grocery store. Not sure what I would buy.– Pat C.
Shoppers always have great deals on eggs. Usually $1.99 or $2.29 most all the time.– Wendy L.
I don’t shop at a pharmacy much unless they have an awesome sale. – Amy K.
Re drug stores: I shop their sales. Butter and soup often go on sale, along with cereal and snacks. It’s not a deal if it’s not something you would normally buy and it’s a bad deal (no matter what the price) if it isn’t healthy for you.– Faith L.
When I lived in London, Ontario, I lived so close to Shoppers Drug Mart. Hubby and I picked up specials all the time. I took advantage of extra points days!! Then, we’d use the points to buy all of our stocking stuffers for the kids! Now I am 20 minutes to a shoppers, and I miss popping in and checking out Shoppers specials and their clearance section for beauty items!!! – Laurie B. Sometimes we buy food stuff at Shoppers Drug Mart. Typically it’s milk, cream, eggs or bacon. Bought ice cream a few times when it was on sale for a decent price. – Judy C.
I find my local drug store (Lawtons) often has tuna on sale. And mushrooms. Those are the two main things I buy there. But sometimes they also have sandwich meats and frozen burgers on sale too! Shoppers is great for eggs.- Melissa M.
I only purchase my drugs from a drugstore as the one I deal with doesn’t carry grocery items…they might sell coffee and a bit of diabetic foods but that’s it.– Colleen K.
The closest we have to a major drug store here is the Guardian Drugs down the street. I buy mostly health and beauty products there but they will have pop or Gatorade on for good prices sometimes.- Christine W.
Eggs are usually the thing that gets me in when Shoppers and Pharmasave put them on sale. The local Pharmasave usually has milk on sale all the time.– Thad T.
Re Pharmacy Shopping: I don’t live close to a Shoppers with Food Section anymore unfortunately. But when I did I would go for the loss leaders: unsalted butter, milk, sometimes cereals and cheese, sometimes bread, cream cheese and ice cream.– Birgit N.
I don’t buy much at either pharmacy in town. They do have sales on convenience products like canned soup and such but I rarely buy packaged food.– Michelle K.
We buy quite a few things at Shoppers and we try to capitalize on their points offers where possible (bought a lot of Christmas gifts using points this year!). Bacon, eggs, butter, chocolate milk, skim milk, cereal all go on sale pretty regularly so I stock up when this happens.– Tracie R.
Our local shoppers often has coupon stickers on products that are Close to expiring but not off code yet….Wonder bread for $.49 for the freezer!- Tanja A.
I have used our local Shopper’s Drug Mart to price match against but have never bought actual groceries there. Snacks, drinks and health-related items, yes but not groceries such as bread, PB, milk, etc.– Della F.
When I had more time I would go to Shoppers to pick up their weekly specials, now due to time constraints I mainly shop at Superstore as their overall pricing is the best here.- Pam W.
My local drug store is the cheapest place in my little town to get eggs, bacon and milk.. even bread! and their bread is fresher than the grocery stores. – Jessica B. Next time you plan to visit the pharmacy don’t forget to include a grocery list along with your medication list. 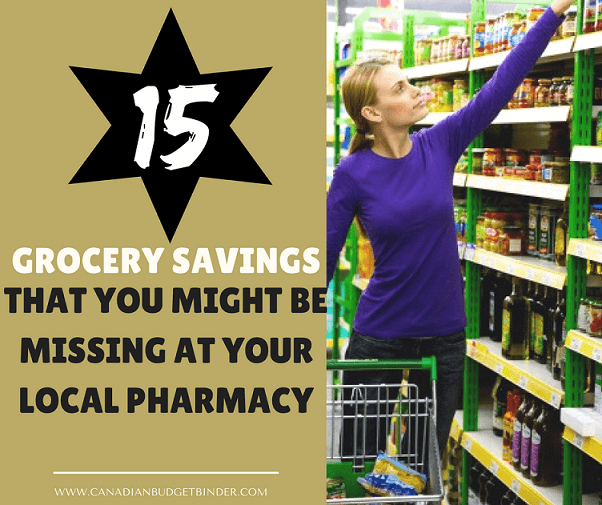 Do you grocery shop for sale-priced food items at your local pharmacy? What pharmacy do you visit as your family pharmacy? I didn’t know the regular prices for the reduced product I picked up so I couldn’t add the amount to my in-store discounts category. I fully expect this which is why the final number in this category may be lower then what actually shows. We did some unexpected stocking up on vegetables from the reduced rack which we cleaned and packaged as soon as we can home. What we bought from the reduced rack were the same products we would have bought apart from the portobello mushrooms. The cream still seems to be a wonderful price so we’ll just keep stocking up when we have the money to do so. I see lots of soup in our future and one happy son who loves broccoli. How was your grocery shopping week? Post your shop in the comment section below. Read Grocery Game Challenge Rules first for more details. Note some links used in this post may be affiliate links. Lots of great sales this week! She has never had a granola bar before so I am not sure but I would assume she would eat one if we let her! She does like those sun rype fruit leather bars lots and I only grab them when they are on sale at Costco. She isnt really a big fan of oatmeal either and hubby puts fruit, cinnamon and a little sugar in it too. Cereal is hit and miss with her so we dont always give it to her for breakie. We love boursin cheese!!! Mary did share a recipe yesterday to make it at home so I may try it out. I want to try and make homemade granola bars with those dried cranberries. Might even see if little miss will eat them cause she does love raisins. Yearly grocery budget for 4 adults and 2 cats -$7800. 1 primula flower in pot -1.99….. a little treat! Under for the week. Stuart and Molly are still good from last year on cat food, treats and litter. Haven’t made it to No Frills in spite of being in town at least once a week but I’m usually getting close to dinner by the time the rest of my running around gets done. Visiting Dad, checking his house and now checking up on my uncle’s apt all takes time too. It will happen at some point, likely when things slow down with the two older gents. Hopefully my uncle gets back home soon but it will still mean more trips into town to look after him too. Right now he is in hospital here near me so i can pop in every day. Being this busy tends to cut down on shopping time!! Another great week. Very pleased I came in under budget again. I scored an amazing deal on yogurt, getting 24 for $2.00. I enjoyed your post this week. I always look at the drug store flyers first. They often have food items priced quite a bit less than the Grocery store. My Shoppers Drug Mart always has a great price on eggs, bread and butter. Everything I bought at Shoppers this week was on sale. I love the enthusiasm in your words when you share your deal about the yogurt. That’s awesome. Finding deals has become a game for us over the years at the grocery store. Most often Mrs. CBB and I both split up and then whistle or make noise if we find a deal, haha. No matter what store we go into we always search around for a reduced rack but first we try to find out how they reduce products and what to look for. Many people don’t know how to source these items because of labelling. In Ontario especially at Zehrs we can almost always find 50% off yogurt and that’s where we will buy it unless we find the Astro Coconut on sale for 1.99 as it’s our favourite. I hope this week we can score more vegetable deals like we did last. The other good thing about SDM is the points which it looks like you already know about. They all add up!! Well done Jennifer. You get ballot #13. I hope you have a wonderful week as well. 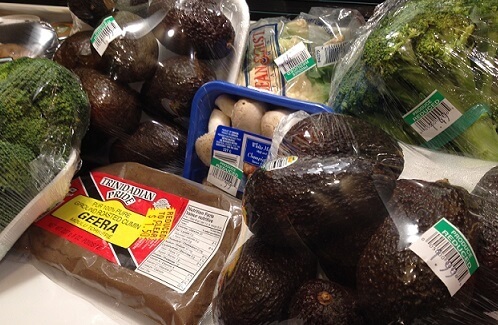 Just to clarify: How many people does your grocery budget feed? Thank you for the kind words. My budget feeds me and then my granddaughter for the three days a week she is with me. I do buy organic when I find a good sale. I must try Astro coconut yougut. I love coconut! Our son loves it and so do I. It’s a thick yogurt without the heavy price tag that comes with a Greek Yogurt. I am under quite a bit under in my shopping so far this month, I am concluding that I have been far more mindful of what is going in the cart and how often I shop, I also had a huge amount of pantry items and freezer items left over from the holidays so I had planned this month to be a clean out the extras month. This is a learning curve and I may revisit my allotted budget I set for myself if I am consistently under by the end of March. I know spring will be a higher amount spending as we have a cabin that we spend weekends at once the weather warms and I am stocking 2 of everything until fall, plus the added company that comes with a lake cabin. My stockpile budget looks like it is very high but I am including personal and cleaning in this as well, I had a lot of this stocked from coupon and am coming to the end of these reserves. I was very happy with all the reduced fruit and veggies this week and could really plan menus with lots of healthy choices. The spiral ham was a total impulse buy but the price was great and so many meals will come from that purchase!! You’re right this is all a learning curve. I find we needed a good 6 months of the GGC to evaluate our shopping habits and whether we needed to increase or decrease the budget. You’re also right about being mindful when grocery shopping because now you have to report back to yourself and all of us. 🙂 This summer will be a great time to see how much more you spend during those months. You can either start a summer stash meaning you add up how much you spent over the summer and save that money every month in your budget as a projected expense so when the time comes you have that reserve ready to go. Talk to Mary Campbell about reserves she the Queen in that department. You can learn lots from her. How many people does your budget feed each month? You probably told us in your first GGC post but my memory is rubbish sometimes especially when I’m as ill as I am today. What a great price on that spiral ham. That was the perfect time to scoop that up. On your first shop you mention you earned 12,700 points… how did you do that? We love our PC points too and have the MasterCard to collect even more. They sure do come in handy. Thanks for letting us know about your stockpile budget. Our cleaning stash has lasted us since 2012 but we’re getting down on many products now. Coupons are nothing near what they used to be in Ontario.Welcome to the GGC again Julie if you need anything we’re here just comment, email or message via social media. You get ballot #12. Good Morning and congratulations on booking your trip home!!! 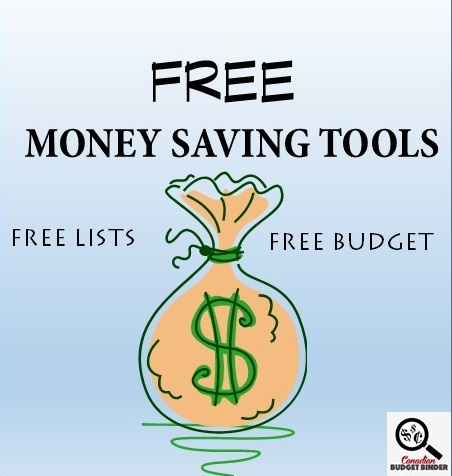 Yes I think Mary Campbell is the queen of budgeting, I read her posts with interest and envy!! We have four people here and two dogs to feed, my last two kids are both in college locally, so much can be saved when they stay at home to attend, there will be a day when they have to move to attend University, but they will do as much here to save on housing costs. We all pack a lunch every day, and it can be challenging meal planning with four different schedules and my husband eats very little wheat and carbs, no allergies he just feels better with this lifestyle. I earned the 12,700 PC points because I had a rare offer of earn 10,000 on a 50.00 spend, and a few other points for some products. I used to use my MasterCard exclusively for groceries for the extra points but for now I switched to cash for now while I start this challenge to see if I spend less, just a little personal experiment!! Your correct, coupons have devalued greatly but you can still find the odd offer that is really great, I kind of went overboard when I started couponing like most people but it has sure been nice to have all the paper products etc that I know I paid next to nothing for however things are running low so I will just restock slowly with great sales. Enjoy your week!! That’s a very good point and another reason we might pop in to buy milk or eggs. Thanks for the reminder.. and yes nice sticker deals too. I shop the food sales at my local pharmacy, just like I shop the personal care sales at my grocery store. Since the stores are all within a short distance of my home, it doesn’t matter which store it is, the best price wins! Exactly the point and these days most stores are all in close proximity or we can price match. Overview: I am quite surprised that I spent so little on this week’s grocery shop. I do have a nice full fridge freezer, my daughter packed it so there is no wasted space. Since I have the meal plan for this week and next and the groceries bought for it, we shouldn’t really need much to purchase next week. I’m thinking the basics which is milk, bread and maybe eggs. There is a couple of new recipes on the plan so I’m hoping they turn out so they can be added to the roster of possible meals. I did buy some treats for us. We typically don’t have chocolate milk in the house and we have decreased the amount of ice cream as well. Yes, I’ve ordered my Chapman’s coupon and can’t wait for it to arrive. We’ll probably use it this summer since we have enough to last quite a while. So far we’ve had one of the new meals (When the Bishop Calls) and I thought it was good, my daughter not so much. It seems that she’s not a fan of mushrooms that isn’t canned. So I don’t know if it will stay in the roster of meals or not. Wow! That’s a whole lot of avocados! If you want to add the savings, I would assume that a net with 5-6 avocados usually sells at $4.99. What are you planning to do with them? I assume they are already quite ripe? I am asking because I had a slight overflow of avocados last week when I accidentally shopped double. In the end I let them ripen a bit and eventually mashed and froze them all. They may not taste as great as fresh avocado on a salad or sandwich, but they are good for smoothies or to make guacamole. So far, so good! I went a little hog wild with the shopping last week but I stayed within the confines of our budget by using the Re-Stocking Reserve to take advantage of some good buys. Originally that particular reserve was intended for replenishing the freezer but I find we are eating a lot less meat these days so last week I tapped it for some non-meat protein items like peanut butter & baked beans plus soya sauce while it was $1.00 off per bottle to use in the preparation of our meals. What can I say…it’s another LOW SHOP WEEK for us. During the 5-week months, I find that having at least one week with NO shopping or possibly a couple of LOW shop weeks are critical for us to stay on budget. I am watching for a couple of sales though – whole chickens so that I can make a Sicilian Chicken Soup and one on gluten free pasta. The dinners I have planned this week are: Homemade Creamy Tomato Soup, Slow Cooker Potato Dill Soup, Tuna Shepherd’s Pie, Southwest Salad, Greek Salad, Spinach Salad & a Chef Salad. I am not going to exactly kill myself getting dinner on the table this week, am I? LOL 🙂 I am however on a mission…a crisper clean-out! OUR CURRENT TOTAL UNUSED RESERVES ARE $1,327.58. This means the $1,274.44 that we carried forward from 2016 PLUS AN ADDITIONAL $90.00 that we have added in 2017, LESS $36.86 that we have drawn out for use in 2017. You know that’s a concept that I’ve never discussed on the GGC and I’ll add it as a topic, Low Shop Week at the grocery store. I agree that this year Mrs. CBB and I are going to work on this for the 5 week months and the other months have a low or no shop week too. I really think avoiding the flyers is the only way to stay out of the grocery store as well, finding something else to do in the time slot that we typically grocery shop. How do you go about having a no shop or low shop week? Nice to hear that you’ve been eating less meat. We don’t eat that much either in our house although we like our mince. When you make the potato dill soup do you use fresh or dry dill? I love all the soups. This is what we do in the winter… lots of soup although the wife doesn’t eat potato (but I do). What can I make with what I have on hand? Do I have any way to kick it up a notch? For example if I have the ingredients to make pancakes…I can spruce up those pancakes into apple pancakes with a single grated apple and a few seasonings and now those pancakes taste and smell like apple pie! For the really fancy occasion, how about buying 2 lobster tails and turning your Plain Jane Mac and Cheese into a Valentine’s Day Special? It’s a lot cheaper than 2 whole lobsters with drawn butter for your romantic dinner at home PLUS a romantic dinner at home is always scads cheaper than trying to dine out with your sweetie on a special day! A well stocked larder means you can go weeks without shopping if the sales just aren’t there. It’s the perfect opportunity to squeeze in a NO SHOP week or two. I won’t pay full price. Will you? I know with what we have in the house already, I could make meals for 6 months to a year just replacing a few basics or adding a few highlight items but more importantly, I could go completely without shopping if I had too. Now that’s a good feeling! I remember being thrilled when Grandma put a pitcher of iced cold water on the supper table for us to enjoy with our meal. Simple can be the stuff that memories are made of!